Thank you for visiting The Society Chronicles, a media platform created as an alternative to the run-of-the-mill lifestyle and social site. We're here to make your world a little more beautiful... offering you content that encourages you to live a better life by providing you examples of how high performers live... and how they've created their stylish success. The Society Chronicles is a force to be reckoned with. Referred to as The Dominick Dunne of Texas by Elegant Texan magazine, founder Lance Avery Morgan combines the best of all pop cultural worlds… those of society, style and creativity. From his role as a seasoned executive with media giant InterPublic Group (WIMC), Morgan offers a variety of experience toward his writing career and responsibilities as founding co-publisher and editorial director of Brilliant magazine, the luxury lifestyle magazine for the entire state of Texas. As a former editor of Elegant Texan, Verve and Cigar Lifestyles and Austin Monthly magazines, Morgan’s track record combines the best of both stellar creativity and senior management. With Brilliant, he helmed securing and producing most of the magazine’s hundreds of cover stories and features of socialites and celebrities such as: Kate Moss, Mariska Hargitay, Emily Procter, Elizabeth Mitchell, Jerry Hall, Andy Roddick, Erykah Badhu, Carol Burnett and Marcia Gay Harden. He has also created insightful interviews conducted with prominent figures as diverse as Cher, Paloma Picasso, Plum Sykes, Salvatore Ferragamo, Carolina Herrera, John Loring, William Yeoward, Michael Dell, Patrick McMullan… and hundreds more social notables reflected in over 60 issues of Brilliant magazine and its website, www.brilliantmagzine.com. Says Liz Smith in her New York Post syndicated column about Brilliant magazine, “One must be a work of art, or wear a work of art," said Oscar Wilde and that quote came back to me when I opened the new Texas magazine called Brilliant. This new magazine gives Vogue, Bazaar and Architectural Digest a run for their money. Brilliant is like the Texas Town & Country.” Dynamic in scope and editorially electric, Morgan’s Brilliant has reflected the people, culture, and lifestyle of Texans on a grand scale. Known for its famous natives, Brilliant has focused on the very best Texas has to offer as the tastemakers, trendsetters and style weavers of the world. Brilliant offers the very best in the luxury universe: celebrity, tycoons, fashion, beauty, travel, transportation, design, cuisine, real estate, arts, culture, and, of course, entertainment. To market this high profile magazine, Morgan has become a notable of sorts himself with media appearances and event emceeing roles. As a social philanthropist, he has hosted and media sponsored hundreds of events across the state that have had such celebrities in attendance as Luke and Owen Wilson, Lily Tomlin, Sandra Bullock, Dennis Quaid and many more who represent the best of high performer talent. These events have proven Morgan to be the event host specialist to draw a significant crowd of hundreds with the right entertainment, décor and sponsors to make it a memorable happening. It’s part of creating a truly memorable experience. Before returning to Texas, Morgan spent much of his career in Los Angeles and San Francisco as a television writer and producer for programming on networks as diverse as MTV, CNBC, Lifetime, FOX Sports, VH-1 and Discovery, as well as a celebrity public relations advisor, too. Morgan was also an executive with internationally recognized public relations firms Niehaus Ryan Wong and Hill & Knowlton. 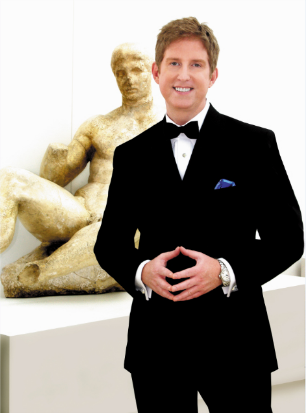 In his spare time, in addition to his philanthropic endeavors, Morgan has also been an on-screen television personality on FOX 7 News, as host and producer of Capital Culture for three seasons, as well as guest hosting for YNN's Fashionably 8 segments. From debs to debauchery, the delightful debut novel authored by Morgan, The Society Chronicles has it all.